Nikolaus von Kues (Nicolaus Cusanus: 1401-1464), born as son of the rich Mosel sailor and merchant Henn Cryfftz, received his higher education at the Universities of Heidelberg and Padua. In keeping with the end of medieval times, his main subjects were mystic, scholastic, canonical law and theology. His doctoral degree was awarded by the University of Padua in canonical law. Cusanus rejected a teaching position as lawyer in the Brabantish Leuven and instead chose a church career. His career path was therefore predictable, although his succession to Cardinal status was quite exceptional for his heritage in those days. His position as Cardinal was mainly spent at the Church of S. Pietro in Vincoli at the bottom of Monte Esquilino in Rome. 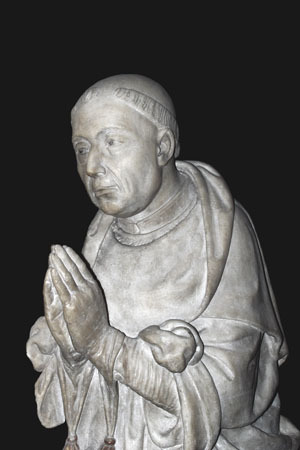 An image of Cusanus can be found on his tombstone and he is also depicted as benefactor on the middle part of the wing altar in the Gothic chapel of the Nikolaushospital. While Cusanus's life was certainly exceptional, it was far from spectacular and it is difficult to speculate why people still talk about him today. It is unlikely that his church career has made him a significant figure, more likely his writing about philosophy and science that made him stand out as an avant-gardist of the new age. His work has something of a diverse flavour, possibly due to his Italian bias and his friendship with the mathematician Paolo Toscanelli.This may have contributed to the disparate disciplines embraced in Cusanus's work. His unique collection of hand written pieces seems to make him an exponent of humanism. However, as a science theoretician he was less interested in reviving the classicism according to renaissance but was more focused on Erkenntnislehre (=Theory of knowledge) of the Latin and Greek world. Such studies were abandoned during medieval times and scientific study came to a standstill for around 1000 years. Cusanus demonstrated exceptional insight for the time and believed the natural sciences could be studied by way of empirical and systematic experiments that were informed by the certainty of mathematics. How can you test, extend and communicate knowledge? How do you avoid misinterpretations and misunderstandings? Preferably with a formal language, which ensures that what is said is exactly what is meant and where the listener only understands exactly what was meant to be said. An important role is played by "statements"; these are linguistic constructs that can either be "true" or "false". Through connection of statements via logical operations such as AND and OR, new statements are made. Statements can be reversed by means of negation. The statement "All houses in Bad Sobernheim have red roofs" is a statement that we know to be wrong. The reversal of this statement is not "No house in Bad Sobernheim has a red roof" but rather "There is at least ONE house in Bad Sobernheim that does not have a red roof". It is obvious that such a formal language connected with precise definitions and minimal axioms constitutes a powerful instrument in dealing with knowledge. Cusanus, despite his appreciation for the power of the formal approach, questioned the universal application of true-false formalism. Firstly, because there are problems that cannot be decided per se [e.g. in a smoothly moving elevator (meaning that the elevator neither accelerates nor slows down) without windows, it is impossible for the passengers to determine whether the elevator is moving]. Secondly, because incomplete or biased information over the object of study do not allow a definitive decision. It is not only the unavoidable "measurement" errors that are problematic, it could be more severe to approach a problem with a fixed "idea", which means trying to generalise previous experience to new and unknown things: "Erkenntnisgewinn durch den Vergleich zwischen Bekanntem und Unbekanntem". Until the end of the medieval age, Cusanus occupied himself with basic scientific theoretical questions that are still important today. It is noteworthy that he did this long before Carl Friedrich Gauss (1777-1855) developed non-euclidic geometry and Albert Einstein (1879-1955) developed his theory of relativity. And Cusanus' ideas are based on thoughts contrary to "common sense" and our idea about nature at first sight. Because in the end it seems obvious that two parallel lines do not cross, right?